Onion bhajis are a spicy Indian snack or starter. 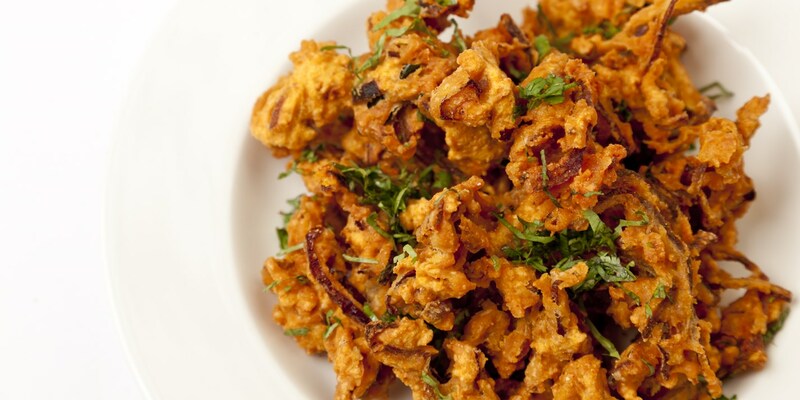 The word bhaji refers to a fritter that has been deep-fried and although there are many kinds of bhaji (mushroom, French bean and plantain are all popular choices), the onion bhaji has become a staple of Indian cuisine in the UK. Bhajis are made with a mixture of rice flour and gram flour which means as well as having a lovely crunch, they are also usually gluten free. Alfred Prasad uses a combination of chilli, garlic, ginger, turmeric and fennel seeds to flavour his onion bhajis, whereas Luke Tipping uses a simpler combination of turmeric, coriander seed and cumin in his. Instead of onion bhajis, try sliced turkey, or ‘nduja and chicken – once you have mastered the basic recipe, experiment with your favourite flavours.